Remove the stalks from the mushroom, clean the mushrooms and dry with kitchen paper and chop the stalks very finely. Fry the chopped pancetta in the oil until beginning to crisp, add the chopped mushroom stalks and continue to cook for 5 minutes then add the garlic and cook gently for another minute before adding the butter. When the butter is melted add the leaves from the thyme and the breadcrumbs. Combine well and cook for another minute. 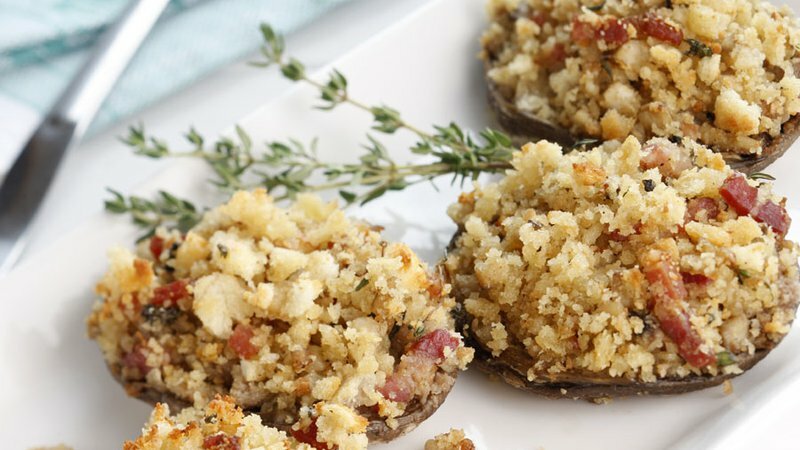 Remove the crumb mixture from the heat and spoon into the mushrooms. Bake in the oven for about 15 mins until the mushrooms are tender and the filling is golden on top. Note: For a vegetarian option replace the pancetta with pine nuts or a suitable grated cheese.